Lake Jocassee is a 9,000-acre, 385-foot deep reservoir located in northwest South Carolina. It was created by Duke Power in 1973 for the purpose of generating hydroelectric power. The lake is commonly known for the clean and cold Appalachian mountain rivers that feed the lake, keeping its waters cool and water visibility clear year-round. The Jocassee Dam, which forms the lake, is 400 feet high and 1,750 feet long. 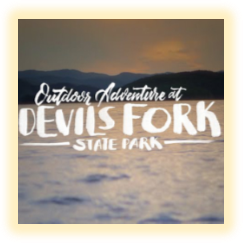 The south end of the lake is home to Devils Fork State Park. Although most man-made structures were demolished prior to the creation of the lake, local divers have discovered the remains of a lodge which was left intact. The lodge now sits under 300 feet of water. A hilltop graveyard with headstones also remains more than 130 feet under the water. As a note of trivia, the cemetery was one of the scenes used in the filming of the 1972 thriller, Deliverance, starring Burt Reynolds and Jon Voight. A confluence of four rivers supplies Lake Jocassee's water. The farthest west of the rivers, the Whitewater River, flows southeast until it meets the northwest corner of Lake Jocassee. The Thompson River flows due south until it too reaches the lake in the northwest corner. The Horsepasture River feeds the lake from the northeast corner, along with the Toxaway River, which is directly east of the Horsepasture River. 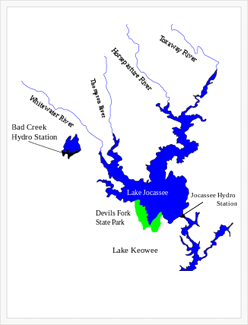 The Bad Creek Hydro Station is located at the base of the Whitewater River, and the Jocassee Hydro Station is located on the Keowee side of Jocassee Dam, which separates Lake Jocassee and Lake Keowee. Also known as the Keowee River. Lake Keowee's furthest extent to the south brings it close to the city of Seneca. Unlike Lake Jocassee, Keowee is heavily settled. Most of the land, adjacent to Lake Jocassee is owned by Duke Power or the State of South Carolina. A rare wildflower, the Oconee Bell (Shortia galacifolia), native to only a few counties in the Blue Ridge area, was discovered in the area in 1787 by French botanist André Michaux. 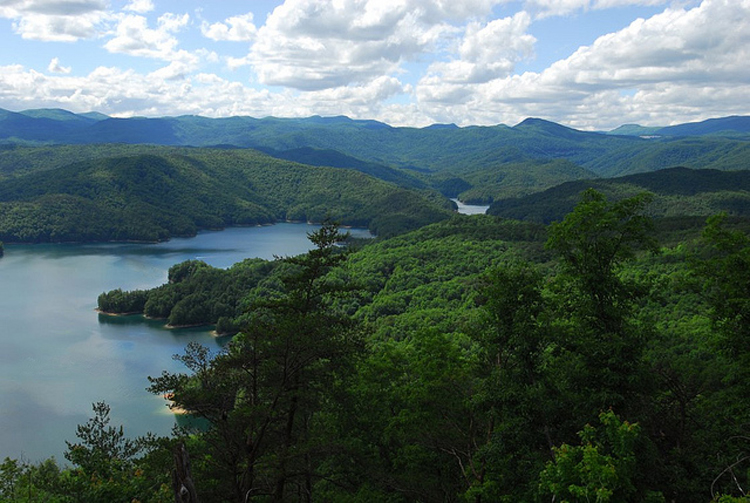 The creation of Lake Jocassee caused the destruction of the heart of the species' range. More recently, biologists have documented the occurrence of a number of rare, threatened and endangered species within the adjacent Jocassee Gorges. The Eastatoee Gorge Heritage Preserve was transferred from Duke Power Company to the South Carolina Department of Natural Resources in 1979 due to the extremely diverse flora occurring there. 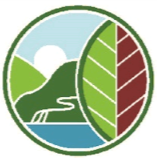 Wildlife management efforts in the Jocassee Gorges area began as early as the 1930s when the Chief Game Warden managed the stocking of trout from the Cleveland State Fish Hatchery, Table Rock State Hatchery, and the Walhalla National Fish Hatchery. This led to the investigation and improvement of fish populations in the area. People hiking, hunting, fishing, and nature-watching benefit from the fish stocking and law enforcement of the Game Management Program (now WMA). The name Jocassee comes from the legend of a Cherokee maiden in a short story written by South Carolina native William Gilmore Simms in the 19th century. According to the story, the Oconee tribe, the 'Brown Vipers' inhabited the west side of the Keowee River, while a rival tribe, 'The Green Birds', lived on the east side. (The Keowee River begins at the confluence of the Whitewater and Toxaway Rivers.) A young Green Bird warrior, Nagoochee, ventured into Brown Viper hunting grounds, where he fell and broke his leg. The maiden Jocassee brought him back to her father's lodge and nursed him back to health, and Jocassee and Nagoochee fell in love. In a later battle, Cheochee, Jocassee's jealous brother, killed and brought Nagoochee's head back on his belt. Jocassee went into the water and did not sink but walked across the water to meet the ghost of Nagoochee. The name Jocassee means 'Place of the Lost One.' The river valleys were home to the lower towns of the Cherokee Nation; the site of Jocassee Town now lies 300 feet beneath the surface of the lake, near the beginning of the Keowee River. Nearby Keowee Town was a major hub in the Cherokee Path that connected Cherokee towns and villages throughout the area. Early 18th century traders supplied local Cherokees with European firearms, ammunition, tools and clothing, paid for with animal hides. In a single year, over 200,000 deerskins were documented in the Port of Charleston alone. However, mounting discord between Europeans and Cherokees brought about by dishonest traders and increasing settlement pressure led to years of war beginning in 1759. In 1785, General Andrew Pickens hosted a large gathering of Indian chiefs leading to a treaty that gave much of the Jocassee gorges area to the United States. The 1785 boundary cut a diagonal line through the basin of what is now Lake Jocassee. Cherokees maintained control of the Oconee mountains on the northwest side of the line until 1815. European settlers, mostly of Scottish and Irish descent, moved in from Virginia and Pennsylvania as well as from Charleston. Land grants in the Jocassee area go back to 1791. Lake Jocassee holds state records for 5 species of fish, including three in the sunfish family (Centrarchidae). In 2001 a 5 lb 2.5 oz Redeye bass and a 9 lb 7 oz Smallmouth bass were caught. An 8 lb 2 oz Spotted bass was caught in 1996. The last two came from the salmon family (Salmonidae). A 17 lb 9.5 oz Brown trout was caught in 1987 and a 11 lb 5 oz Rainbow trout was caught in 1993. The Jocassee Hydro Station, owned by Duke Power, in between Lake Jocassee and Lake Keowee, is a 710 megawatt pumped storage facility. Also, just off the Whitewater River, Bad Creek Hydroelectric Station is a 1,065 megawatt pumped-storage facility that started generating electricity in 1991 and is also owned by Duke Power. Both facilities provide jobs for the surrounding area.